Learning another language provides access to the world. For as long as I can remember, I’ve always had an affinity for the Spanish language. Growing up in New York City meant that Spanish was as common as dollar slice pizza. Spanish was in subway ads, my favorite TV shows, the music on my Walkman, the corner bodega. But, as a kid from the projects of Bed-Stuy, Brooklyn, Spanish-speaking countries like Spain or those in Latin America seemed as far away to me as Staten Island. So I did the next best thing - I studied Spanish in school. In my junior year of high school, an opportunity to study abroad appeared, but my heart sunk when I saw the price tag. It reinforced the idea that ever going international was not meant for kids like me. When a similar opportunity appeared in college, I rejected it again without hesitation, telling my advisor that I couldn’t possibly afford it. He insisted that with my skill set and passion that I belonged on the trip and pledged to support me. Within a week, it was settled. 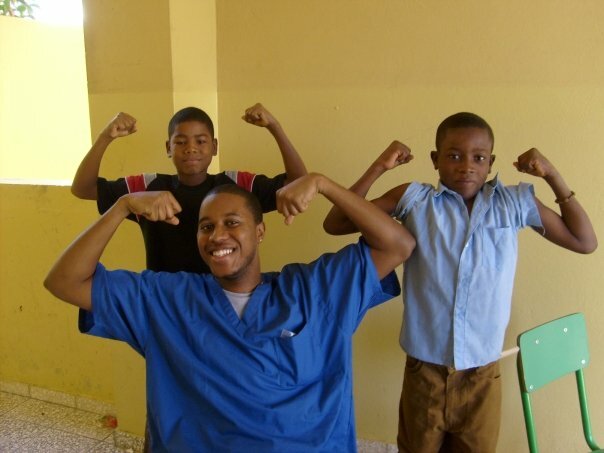 My first trip outside of the U.S. would be a service trip to the Dominican Republic to support a public health project in a barrio outside of Santo Domingo. I remember every sight, sound, and smell from that trip. I remember the airplane buzzing with conversation from we “eager-to-change-the-world” millennials. I remember being enthralled by Anthony Santos’s “Donde Estará” blaring from the speakers in a local colmado. Most of all, I remember the nervousness realizing I would have to actually use the Spanish I’d only been learning in the classroom up until then. The nerves dissipated quickly as with each conversation, my confidence grew. That week-long experience catalyzed something in me -- not only would this Bed-Stuy kid see the world, but he would engage with it. My first international trip pushed me to see myself differently. I began to explore all the parts of who I am: my privilege as a Westerner, my struggle as a Black American, and my impact as a U.S. citizen when traveling abroad. I returned to the United States with a refreshed sense of purpose. Since then, I’ve taken every opportunity I could to travel, develop my Spanish skills and engage with the world outside of Brooklyn. I spent a semester abroad studying Spanish in Seville, Spain. I hiked a volcano outside of Managua, Nicaragua and lived with a homestay family a few hours south in San Juan del Sur. I backpacked solo through Costa Rica, Panama and Colombia, ziplining in the jungles of Puerto Viejo de Talamanca, island hopping through the Guna Yala, and dancing on the beaches of Taganga. My language skills grew tremendously, a newfound sense of independence and curiosity enveloped me, and, most importantly, I was able to connect with people from vastly different backgrounds than my own. These experiences inspired me to become a high school Spanish teacher at a predominately Black school, where I could speak earnestly about my background. I was a Black boy whose life was transformed by studying abroad and whose self-esteem was bolstered by linguistic studies. It opened me up to the world, helped show me who I am, build cross-cultural connections and presented me with numerous opportunities. Villa Mella, Dominican Republic. January 2008. There is extensive research that shows studying abroad changes a person’s life. We know that a student’s engagement in learning, their sense of confidence, and their motivation to continue studying a second language at the university level improves after traveling and studying in a foreign country. I decided to start Teens of Color Abroad because I saw myself in many of my students: the drive, the curiosity, the passion and the need for a chance. My experience is not at all unique. Ask anyone who studied abroad how those experiences impacted who they are today, and I am certain the response will be somewhere between a long story of a memorable adventure to a short anecdote of some transformative experience. At TOCA, we believe everyone should have equal access to this opportunity of a lifetime. Everyone, including teens of color. Because they deserve the world, too.